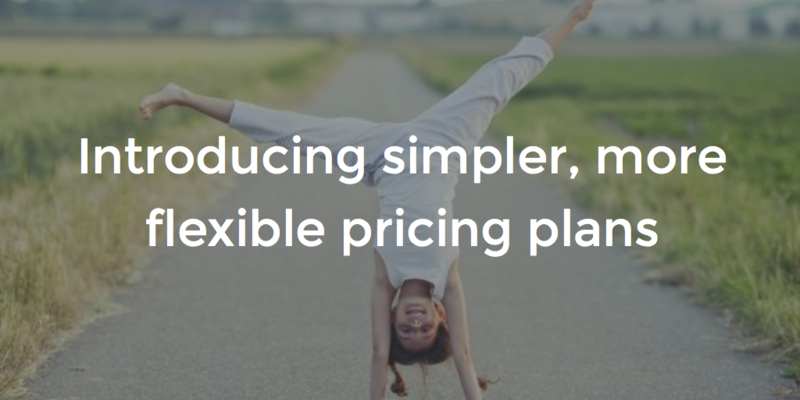 We’re excited to announce that starting this week, we are changing our pricing model here at Blitzen. After a lot of conversations with our early adopters and prospective customers we’ve found that our initial tiered pricing model was not the most optimal for serving our small & medium business clients that are looking to jumpstart their growth marketing efforts. We realized that your business needs can’t be ‘put in a box’ which is why we’ve thrown out the old tiered model for a simpler, more flexible model that is designed to scale with your business as you grow. We’ve given careful consideration to which pricing model will make Blitzen the best personal marketing solution available to small & medium businesses. We know that our new model looks quite a bit different from what we had in place before, which is why we wanted to share the reasoning behind the change and explain why we think it will be more beneficial to you as you build your business with us. With our previous, more traditional, SaaS pricing model you can see that the options are limited to four tiers (Startup, Pro, Growth and Enterprise). This more rigid approach had us trying to guess at how many contacts you would need at each and which features should go into each tier, which meant that we weren’t always able to deliver the right amount of usage and functionality that you were looking for. 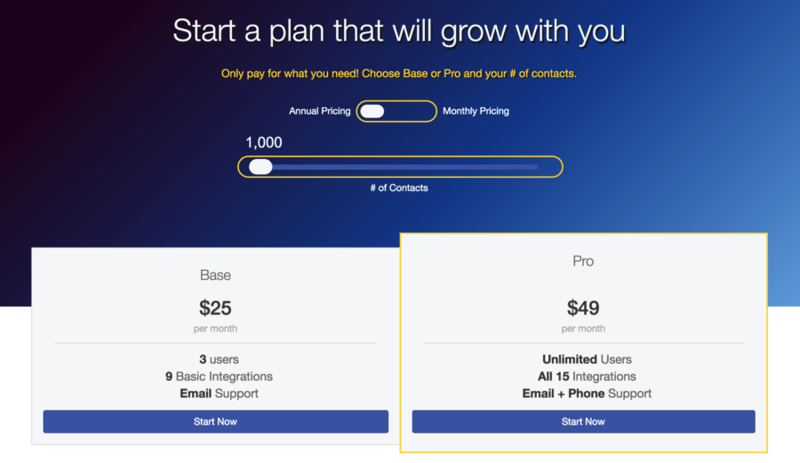 You’ll noticed that we’ve tossed out the four pricing tiers in favor of a slider bar that allows you to choose from a wider range of contacts but then also reduced the number of feature tiers to just two (Base & Pro). We’ve chosen to do it this way because it enables us to deliver to you three important benefits: simplicity, flexibility and affordability. Variety isn’t always the spice of life — sometimes fewer options are better. With our new approach, we wanted to make it as easy as possible for you to choose the features that will fit your needs the best. That’s why we decided to simplify our model by offering just two tiers of features (Base vs. Pro) as opposed to our previous four tiers (Startup, Pro, Growth and Enterprise). This simpler approach means that you will now benefit from more of Blitzen’s advanced functionality like progressive profiling and behavior tracking without having to choose between too many tiers. We know that one size doesn’t fit all when it comes to the size of your contacts database. By introducing the new slider bar method of selecting your number of contacts, we’ve made it so you can more flexibly choose from a wider range that will fit your database needs more precisely, without having to sacrifice any feature functionality. This approach allows you to scale up the size of your contacts database without having to make the leap to a much more expensive tier, meaning you only pay for what you need. Our mission at Blitzen is to make advanced lead generation and marketing technology more accessible to the small and medium sized businesses. I mean, why should enterprise have all the fun? This is why we decided to make it even easier for you to say “YES!” to online marketing software by introducing a new $25/mo entry point. This way you can reap the rewards of better website conversions, increased productivity and improved marketing ROI without any risk to your monthly cash flow – we promise! We know that we’re only going to be successful if you are, so we want to help you in every way we can when it comes to choosing the plan that is the best fit for you business. Our sales team is always prepared to walk you through the different plans to help you find exactly what you need. Just go to www.blitzen.com/pricing to see what’s available or feel free to reach out by contacting sales@blitzen.com or call 519-504-6150 to chat.